When beginning to work on a project, there are two things to keep in mind right off the bat: yarn weight and hook size. Different types of projects and patterns call for different sizes of hooks, and the same goes for different yarn weights. Basically, the thicker the yarn is that you’re working with, the bigger the hook should be. While it’s true that you can pick a hook size that’s somewhere in the middle of the range for most projects, there’s a specific type of hook that matches with a certain yarn weight, and that combination works best for certain projects. Hooks in the US typically go by letters from B through S, with S being the biggest. UK sizes are listed in millimeters that also match up to the US letters, though with more variations in between, and if you’re confused by any of this, there are plenty of charts online that help illustrate the size relationships. They can be made out of aluminum, bamboo or plastic. There are also steel hooks, which are much smaller and are typically reserved for fine lace thread. These hooks aren’t designated by letters but by numbers from 6-8. 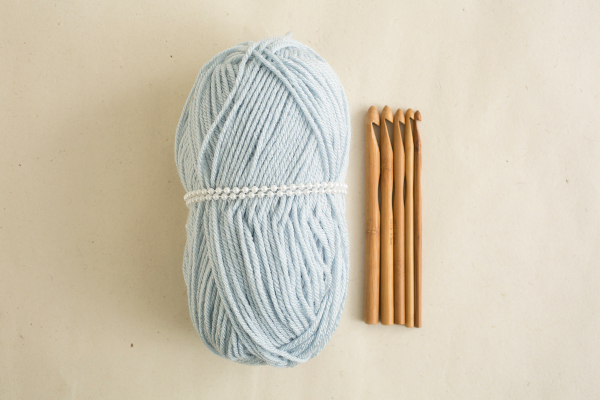 Yarn weights range from 0 to 6, with 6 being the thickest and 0 being the thinnest. Each yarn weight works the best with a few different hook sizes. While you can create basically anything out of yarn with virtually any hook size, there are combinations that work better than others. For example, a winter scarf is usually made with thicker, not thin and thread-like, yarn. On the other hand, when you’re working on something delicate, like a lace doily, you wouldn’t want to use anything but very fine lace thread. What’s the best hook size and yarn weight combination? It all depends on what you’re trying to make. 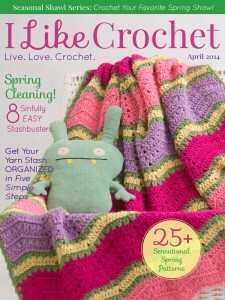 For now, let’s start with the bulkier yarn and bigger hooks – anywhere from a size M-S. The S hook is the thickest hook and measures about 19mm in diameter and the M hook measures 9mm. Because of their thickness, these hooks are best paired with roving yarn or wool, a weight category of 6. The best time to bust out this yarn and hook combo is when you need a new chunky cowl, scarf, hat, or sweater – think super warm and cozy. This is the thickest type of yarn out there. As you crochet, you’ll be making fewer stitches than you normally do because of the bulk of the wool, so each project will take you less time than if you were using a smaller hook and thinner yarn combination. This is also the perfect hook and yarn mix to crochet some plush throw or area rugs (or a full rug if you’re ambitious enough). The finished rugs will be padded and sturdy enough to take on the extra stress of walking and standing. If you’re feeling extra thrifty and have a few old t-shirts around, you can cut them up and fashion them into strips to use as your yarn; these hook sizes are just right for that. Love the recycled sheet idea. Now I’m thinking it is time to get some new sheets and do this with the old. Size Q and S hooks are great for taking old sheets, cutting in a spiral into one continuous 1 in strip, the single crochet your way to a recycled rug for bath or kitchen making whatever size you prefer.